Super Bowl LII is set, with the Philadelphia Eagles facing off against the New England Patriots on Sunday, Feb. 4, in a rematch of the 2005 Super Bowl that the Patriots won 24-21. New England Patriots fans celebrate after defeating the Jacksonville Jaguars in the AFC Championship game at Gillette Stadium in Foxborough, Mass., on Jan. 21, 2018. This will be the 10th Super Bowl appearance for the Patriots, setting a new NFL record, according to ESPN. After winning the Super Bowl last year, New England is the first team since the Seattle Seahawks to get to back-to-back Super Bowls. They’re also looking to be the first team to win back-to-back championships since they did it themselves in 2004 and 2005. Last year, the Patriots overcame a 28-3 deficit against the Atlanta Falcons to win Super Bowl LI 34-28 in overtime, the largest comeback in Super Bowl history. Quarterback Tom Brady dominated in the second half of the game and broke several Super Bowl records, including pass attempts, pass completions and passing yards. If the Patriots win this year, Brady would be the oldest starting quarterback to win a Super Bowl, overtaking current record-holder Peyton Manning. Brady would also be the first NFL player in history with six Super Bowl rings. A fan shops for Philadelphia Eagles apparel in Philadelphia, Jan. 22, 2018. The Eagles defeated the Minnesota Vikings 38-7 in the AFC Championship on Sunday to advance to the Super Bowl against the New England Patriots. The Eagles are 0-2 in the Super Bowl and are making their first appearance in the championship game since their 2005 loss to the Patriots. Quarterback Nick Foles’ journey to this year’s Super Bowl hasn’t been easy. 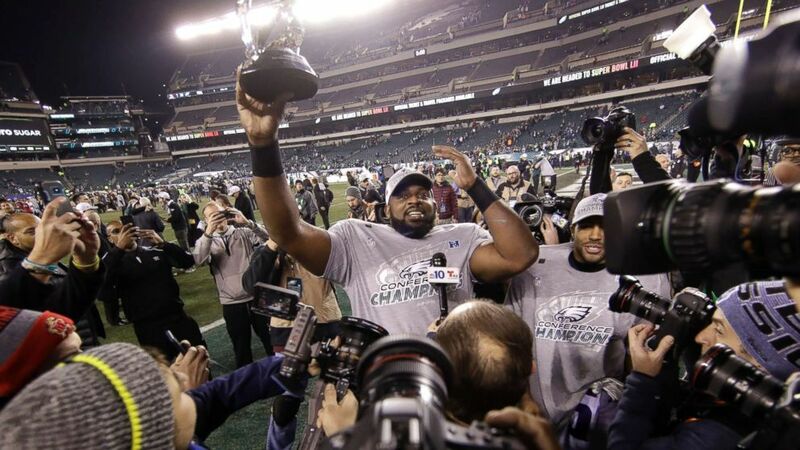 He was named the Pro Bowl offensive MVP in 2014 while he playing for the Eagles, according to sports site SB Nation. He spent just one more year in Philadelphia before being traded to the now-Los Angeles Rams, where he underperformed. He was eventually benched in place of Case Keenum and released after the Rams drafted Jared Goff. After a stint with Kansas City, Foles made his return to the Eagles and is now looking to be the 10th backup quarterback in NFL history to lead his team to a Super Bowl victory, Sports Illustrated reported. The Eagles are the biggest Super Bowl underdogs since 2009, according to ESPN. Super Bowl LII will take place on Feb. 4 at 6:30 p.m. ET on NBC at the U.S. Bank Stadium in Minneapolis, Minnesota. Justin Timberlake will perform at halftime for the third time in his career. ESPN and ABC News are both owned by parent company Disney.